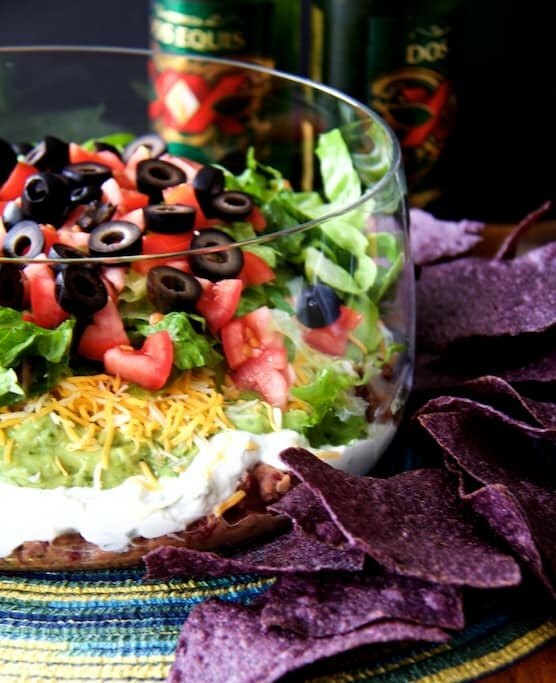 Here's classic Seven Layer Dip made lighter and fresher! Perfect for your game day gathering--or any gathering! FIRST LAYER: Heat olive oil over medium-high heat in a skillet or saute pan. Add the beans and saute 2 to 3 minutes. Add the salsa, cumin, garlic and salt and black pepper. Remove from heat. Using a potato masher, mash the beans. Let cool then place in the bottom of a large glass bowl. SECOND LAYER: Combine sour cream or yogurt, scallion and jalapeno in a bowl and mix well. Carefully layer over bean layer. THIRD LAYER: Combine avocado, lemon juice, scallion, cilantro and salt and black pepper in a food processor or blender. Pulse to combine, leaving a bit chunky. Carefully spread over sour cream layer. FOURTH LAYER: Add the cheese. FIFTH LAYER: Top with shredded lettuce. SIXTH LAYER: Top with chopped tomato. SEVENTH LAYER: Top with sliced black olives.